Here is another image that began with the photos I took January 15th with my new digital camera. 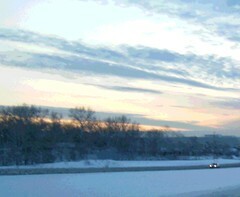 This is another view of the sunset seen from Route 128 in Massachusetts, the second in a series of four images. In fact, I cropped this image from the same photo that was the basis of yesterday's post. But in this view, I cropped out the main highway, and concentrated all the attention on the road on the left side of the image. I did not crop out the lone car in the picture because I thought it added something to the composition. (I was impressed with how much I can crop with my new digital camera and still get a very clear image, clearer than with my phonecam. But I still love my phonecam and there is nothing better for spontaneity.) As with yesterday's post, I used Painter IX to posterize the image just a little bit.